Captain Hook from the Disney Peter Pan film is a great character to choose for a costume party. 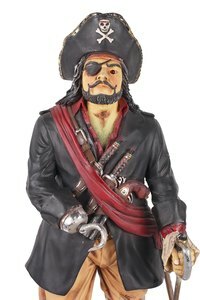 Hook's most distinguishing feature is the metal hook he has in place of a missing hand. You can make your own hook in 20 to 30 minutes with cheap materials, the majority of which are recycled. A long red coat, plastic sword, black trousers tucked into a long pair of black boots, white frilly shirt and red or black pirate hat are easily found items that complete the outfit. Paint a disposable paper cup black with poster paint and leave it to dry. Use scissors to cut one of the large rectangular panels out of a cereal box. Fold the cereal box cardboard panel in half with the plain side facing outward. Draw a hook shape onto the folded cardboard. Cut around the hook shape with scissors. Stick the cardboard hook shapes together with art glue leaving a 1 1/2-inch gap at the bottom (the opposite end to the hook) free of glue. Cover the hook with silver baking foil. Use clear sticky tape to secure the foil to the cardboard shape. Bend back the two flaps at the bottom of the hook where it is not glued together. Fix the hook to the bottom of the black disposable cup with glue. Stick clear sticky tape over the top of the flaps also to secure it firmly to the cup. You can also make a hook for your Captain Hook costume with pipe cleaners, silver foil, silver card and clear sticky tape. Twist two pipe cleaners together and bend them into the shape of a hook at one end. Cover the hook with silver foil and use clear sticky tape to secure it. Cut a 4-inch diameter circle out of silver card and use a skewer to make a hole in the center. Push the bottom of the pipe cleaner hook through the cardboard disc. Flatten the pipe cleaners out on the back of the card and tape them into place. Supervise and assist children with sharp scissors. Cover your work surface with old newspaper before painting and gluing your hook.